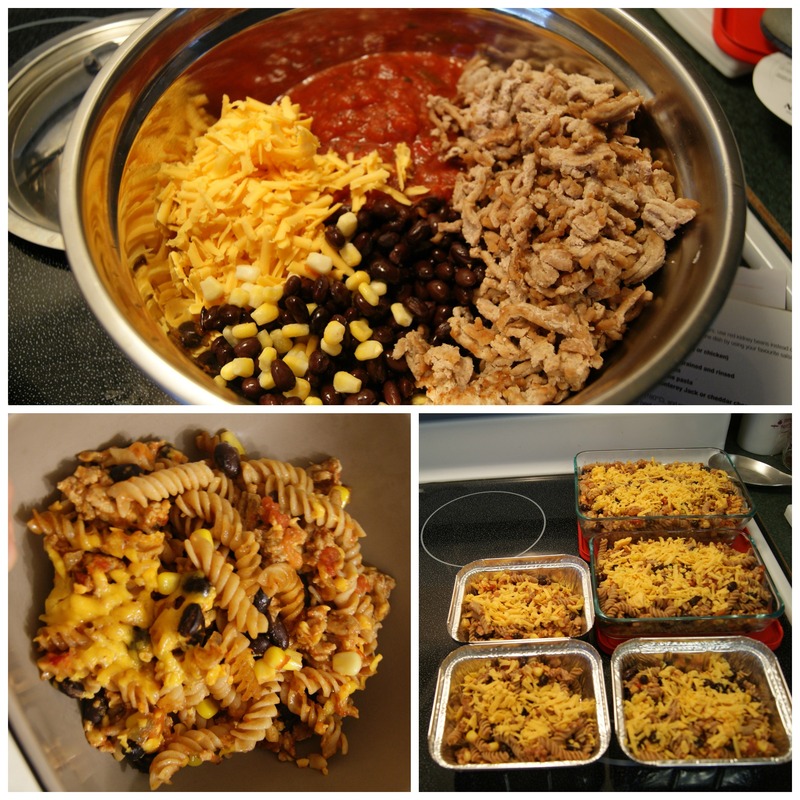 Week 3 Meal Planning – How It Really Went! Week #3 of my meal planning was by far the best week yet. I’ve learned that I need to start planning on Wednesday or Thursday for the following week. I start my planning for Sunday’s and end on Saturdays. When I don’t get around to planning our meals on the weekend it seems that I really suffer those first few days. Lesson Learned I guess! Sunday: Russian Chicken ~ No problem as all I had to do was take it out of the freezer, make rice and warm the chicken up on the stove. Win-Win for me! Monday: Salmon, Baked Potatoes, Carrots, Pea’s. This by far is my favourite meal…I love salmon. Tuesday: Mexican Baked Penne. Accomplished this task. It takes a while to make and makes SO MUCH that I’m able to freeze more than 1/2 the recipe. Sometimes, if I am organized I can split the recipe and make 1/2 vegan and 1/2 meat. Sounds like a lot of work but it’s really not that hard. Wednesday: Chicken a-la-King with Basmati Brown Rice. Made this from scratch in-between nap time for Hilary and playing with her all day. Thursday: All Things Red Soup. Easy to make and so good…even our toddler ate it!!! I have some frozen for work next week (lunches) and taking some out today! Friday: Vegan Sheppard’s Pie. Didn’t happen. I was way to tired and didn’t want to make anything. Sai wasn’t home so I decided to have left overs. BEST. DECISION.EVER! A pretty successful week. Whoop Whoop! On the fitness front – yoga has been creeping into my life one day at time….and another, and another! My legs are sure hoping for a run this week…even in this COLD weather we are having in Nova Scotia. It’s supposed to be -7 but feels like -16 celsius is this morning!!!!! Yikes! Week #4 meal planning is still a work in progress but I’ll share that with you later today. Any good eats this weekend? What’s your favourite – Eat Out or Eat In ? ← You Don’t Judge a Book By It’s Cover…. I made a steak and mushroom pie from scratch yesterday. Not terribly health but it was a treat for Sunday and exactly what you want when it’s freezing (as it is in London at the moment). I enjoy eating out but I really love cooking and knowing exactly what has gone into my food so I would say I am probably more “eat in”. It’s pretty cold here too (Nova Scotia). I enjoy cooking but every so often I just want to eat out. I’ve been cooking a lot lately too instead of eating out or grabbing junk. But planning ahead is the hardest thing to do! Yesterday I made chili with ground turkey. I didn’t feel like it, but my husband got it started, so I’m glad we made it. It’s pretty low in calories and healthy. Planning is the hardest part but then again if I don’t plan ahead I find myself thinking about the next meal and unable to enjoy the one I’m eating. I’m making chili tomorrow … nothing like a little warm food on these cold days we’re having! I love how you do a recap of what you really ate! I post my weekly meal plan every Sunday, but it doesn’t always go as planned. This would be fun to do a follow-up. Thanks for the idea! Thanks! I am trying hard to meal plan but in reality it doesn’t 100% as planned. Plus it’s fun to see where we’ve change out plans. Nice job! That all sounds delicious. I am going to have to try the advanced planning method myself. So far I have been a massive meal planning failure. I also feel bad for complaining about 20 degree runs now. You have it waaaaaaay colder up there! Ha ha, yeah it’s cold but only going to get worse! I’m fine with the cold, it’s the “getting there” part I don’t like. Once it’s cold, I’m good but these up/down temps make it hard on the body. Mexican baked penne! OMG yum!! I love to eat in, but sometimes you just need that fun night out! I totally agree! We don’t eat out very often, especially with two little ones. Haha yes, I remember how hard it is to eat with little kids. I’m the oldest cousin (which is completely different), but I remember quite a few dinners with naughty kids followed by a trip outside the restaurant until they would behave haha. We’ve got one that is pretty good but really interested in watching others in the restaurant (3 yrd old) and the other is just interested in dropping stuff on the floor! Spaghetti squash! I love it! Your Mexican penne looked really good. Oh, and if you have an iPad, yoga studio is a good app.